Our 86th Agricultural Fair was a wonderful day with weather so perfect and enthusiastic fair goers all day long. One of our new features at the Fair this year was an open invitation to many Non- Profit organizations in our wider community. This was Bil’s idea, and it was a great one! The non-profits added a new dimension to the fair, and allowed those groups to showcase what they do. Thanks Bil! We had live music entertainment right up to the last moment of the fair, and we thank Dearta Fusaro for lining all of that up. Also, we thank all who helped to set up and to take down, especially Doug Shepherd who leads us in that department. So much of the take down was completed right after the fair, that we were allowed to not make a hasty return the next day to continue working. Thank you to Justin and Dearta Fusaro and friends! We are thrilled to welcome 4 new members to our Grange, Patrick and Carmen Kennedy and Martin and Mary Kennedy. Pat is Martin’s and Mary’s son, and Carmen is Pat’s wife. Pat has been a contestant in the Adult Baking department of the fair for many years, and we are delighted to finally welcome him and his family to Cannon Grange. In fact Pat was this year’s winner of the 2-crust Apple Pie contest from ACF. He’s off to the state level competition. We continue with hosting two sessions of Tai Chi every Wednesday. 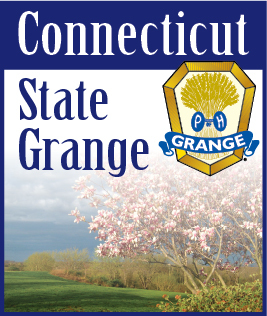 Come give it a try, we have drop in classes in the morning and evening--check our website, www.cannongrange.org . New Officers for this year are: Doug Sheherd, President; Dearta Fusaro, Vice-President; Michele Clark, Secretary; Don Offinger, Treasurer; Bil Mikulewicz, Programs; and John Kriz, Executive Committee. Our meetings being at 7 PM, and the schedule is noted. Visiting Patrons are always welcome--won’t you join us?